Prior to arriving to my parents’ house I’d mentioned that I had little faith in my dad making it through his 10 Days of Real Food pledge during our visit. Well that was just too easy to predict. Not only did I doubt he had even read the rules prior to starting, but I never once saw him read the ingredients or ask questions before eating something. So on day 3 of his “attempt” to play along with us he announces “I am going to have to stop my 10 days because they have short ribs on the menu at the restaurant tonight and I really want them.” I don’t know if it bothers me more that my mom can’t even imagine trying to do the pledge with us or that my dad doesn’t at all take his attempt seriously. Regardless, we are continuing on day 41 of our journey with or without the support of my parents even while we are staying at their house. It is unfortunate that they didn’t want to gain anything from a first-hand and eye-opening experience of what it is like to seek out real food in our processed food world. On a lighter note, our children thankfully seem to be doing just fine with what I have been feeding them on our trip. I honestly don’t know if it is because I’ve been doing a good job of shielding them from the forbidden foods or if they are starting to not care about those foods as much. Two nights ago we went out to dinner to Ocean Club on our boat trip and I attempted to simply order off the menu without bringing anything in my purse to supplement the kids’ meals. One thing I have learned since starting our pledge is that I can never order off the kid’s menu anymore…it almost always contains highly processed foods or foods made with highly processed ingredients! I was pleased that this particular restaurant was flexible and allowed me to create a plate of the adult side items for my girls to share. 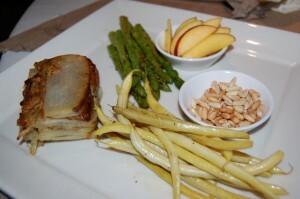 Pictured is what we ended up with…some peaches and toasted pine nuts that I saw offered on a salad and side items of both potato gratin and green beans (they just threw the asparagus on there without me asking for it). I am not going to lie and say they scarfed it down, although they did like some things more than others. What they didn’t eat us adults finished for them, and we thought it was pretty good! Yesterday we had a very late lunch of PB&J so my girls weren’t too hungry by the time dinner rolled around. Regardless, I decided to boil some whole-wheat pasta and make some spaghetti sauce for them. I recently tried making homemade spaghetti sauce (from fresh tomatoes) for the first time and it is surprisingly easy and delicious. When I say “easy” please note it does require some of your time, but not much skill. The adults supplemented their spaghetti with some fresh caught seafood that we bought on the island, and it actually turned out to be a delicious combination. Just a few more days up north before we head back home! I wanted to share this tomato sauce recipe that I saw on a cooking show. It sounds very good. Maybe you can replace the sprinkle of white sugar with a little honey to take away the bitterness! 1. Place a heavy cast pan to heat up. 2. Wash the tomatoes and halve roughly. 3. Place into the hot pan and season with salt, pepper and a touch of sugar. 4. Add the anise and vanilla. 5. 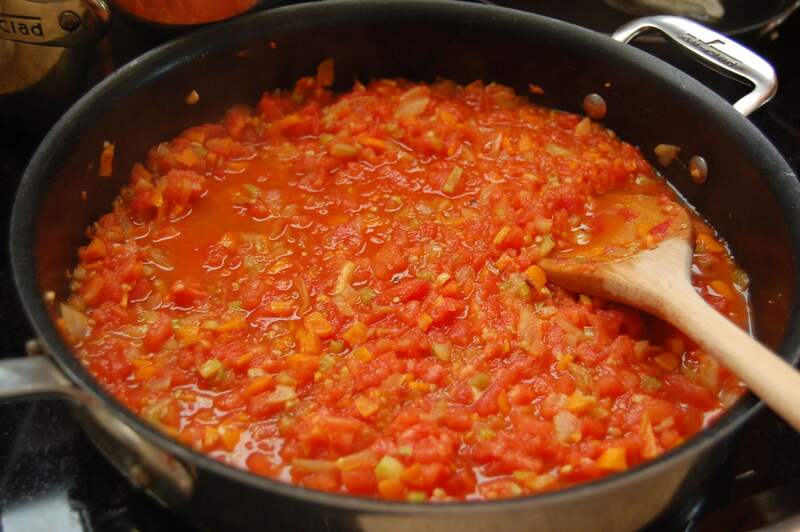 Allow the tomatoes to start to cook then press them gently with a masher to help them to release their juice. 6. Reduce the heat down to just simmering and continue for about 1-2 hours until a thickened paste. This slow evaporation of the moisture from the tomatoes will produce a deep color concentrated flavor without any bitterness. 7. Crack the garlic and add along with the basil which is just halved and throw in. 8. Combine with the warm paste and finish with a good amount of olive oil to finish the infusion. Allow to cool before storing ready for use. I just printed it and will give it a shot…thank you for sharing! I recently found your blog and decided to read through your older posts. It is very encouraging to read about your going on vacation home (to Nebraska, I think it was?). I have yet to have children, but my husband and I have completely changed how we eat since leaving our home in small-town North Dakota. Whenever we go home to visit, I think about how we will keep our children from eating the way we left behind- casseroles, white bread, food that doesn’t expire for years, etc. Thank you for giving helpful tips on what to do when going home and when going out to eat with others. Also, my dad is similar in how he will not make an effort to eat healthy. Someday he’s going to get sick of my pestering him to stop drinking soda. Thanks for your comment! And actually we went to my parents house on Cape Cod (Mass) although I did not grow up there. I am not sure where Nebraska came from? LOL Anyway, I am glad our little adventure was encouraging because while it is a lot of work to coordinate when traveling it can be done! Oh, sorry. Nebraska came from The Happiness Project blog. I guess I follow too many blogs to keep straight which person is from where. Thanks again! I thought your parents were supportive. They didn’t eat exactly the way you were but they weren’t pressuring you to change or sneaking the grandchildren cookies behind your back either. I like that you prepared them ahead of time and sent a menu. It is hard to have visitors and try to plan a menu everyone will eat.